Compound Managers are very familiar with the application of automation and robotics to manage what are often very high-throughput plate-preparation processes. By contrast, biological sample management has involved lower throughputs and more manual processing. This is starting to change, and we are seeing increasingly high-throughput processes being applied to biological materials. As a Compound Manager with experience of automated sample management, you may find your expertise being called upon to help out. Some Compound Managers welcome this potential expansion of their remit. There will be many lab managers, I suspect, wanting to keep biologists at bay and to keep biologicals away from their slick compound management operations. While the required processing may be similar, biological samples do differ in significant ways. They wanted to generate assay-ready plates with some complex Z-pattern dilution series, and then have the plate maps exported to ActivityBase for analysis. This seems a reasonable request – after all it was the sort of thing the Compound Management group were doing every day with their small molecule collection, and Mosaic can manage complex dilution series easily. On closer examination, it turned out that there were a few snags that put a spanner in the works of their slick process. Instead of being able to manage the process from end to end with Mosaic, they now had to follow a process that involved complex manipulation of spreadsheets, macros, and data transformations to produce the required worklists for their liquid handlers and to generate the right files for import into ActivityBase. They told us, “We were flying by the seat of our pants!”. They found they were spending a disproportionate amount of time managing this relatively small proportion of samples because they had to be extremely methodical to check and re-check their processing and avoid any errors. Knowing that there was scope for managing samples with higher efficiency, the Compound Managers approached us to see if we could help. Working together, we found a simple solution to allow them to use Mosaic to manage the antibody plate-preparation process without interfering with the existing compound management processes. So, what were the challenges, and how did we address each one? Challenge # 1. The antibodies were not registered. Mosaic was integrated with the corporate registration system for compound information, but this registration system held no information about the antibodies. This was partly because there were too many samples to register in the corporate system – it would take far too long as there was no automated way to do it. But it was difficult to justify too. For a screening project of say 30,000 samples, only about 30 of them were likely to pass the primary screen and the remainder would be discarded. Yet without some form of registration, these substances were not visible to Mosaic. Fortunately, Mosaic has its own internal registration system and the solution was to activate this on the customer’s system – to work alongside the corporate registration system. The spreadsheets of samples could then be imported into Mosaic; creating both the samples and the plates in one rapid import, with a unique ID automatically assigned to each. The plates were now available for processing just like any compound plate would be, and from this point onwards the samples were being tracked accurately through all stages of processing. Challenge # 2. The antibodies had an unknown concentration. Although the concentration would be determined later in one of the assays, the tools for exporting plate maps to ActivityBase expect there to be a valid concentration. The challenge here was to be able to export unknown concentrations to ActivityBase, when the export process expected a valid value. At Titian, we configured a new setting for the exporter to allow a null value. This setting could be simply selected in the workflow template allowing the export to ActivityBase to proceed automatically at the end of the automation run. Challenge # 3. The samples were aqueous. When pipetting small amounts of liquids, the properties of the liquid can have a significant effect on accuracy. The Compound Management group’s liquid handlers were set up to expect DMSO-based liquids. While automated liquid handlers have settings for different “liquid classes” to account for different sample types, clearly these would need to be changed when switching from compounds to aqueous biologicals. Mosaic already knows the type of liquid for every solution in its inventory, and its associated liquid class, so a small modification ensured that this information was passed to their Agilent Bravo liquid handler software at run time. Thus, the Bravo was automatically calibrated for whatever sample type it was dispensing at the time. 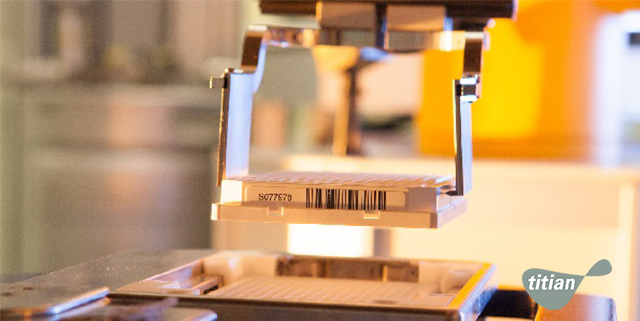 As a result of these changes the compound management group were able to process the antibody plates alongside compound plates – tracked end to end and exported automatically to the assay results system. After the process had been in place for a while, we revisited the customer to learn about the benefits to them of being able to apply their automated processes to biological samples. It turned out that this had become something of a growth area. As the word spread that the sample management team could generate assay plates for biologicals and export the plate maps to ActivityBase, plates of other biological substances started to arrive. These included different antibody types and enzymes. One of the obvious benefits for our customer was the great time-saving gained from removing the need to perform the work through spreadsheet manipulation. But even this wasn’t the biggest win. The most important benefit to them was sample traceability. Using Mosaic for processing the antibody plates and exporting the plate maps automatically gives them end-to-end traceability of these samples. Why is traceability so important? Well, if you go through several rounds of screening and hit-picking to find a drug candidate and you can’t trace it all the way back to where it originated from, then you’ve wasted a whole lot of work. So, the traceability afforded by using a common tracked process for these biological sample types was an enormous benefit. So, as a Compound Manager, if you find yourself being asked to take on the management of biological samples, don’t assume it is going to cause you headaches. It can make perfect sense to manage diverse sample types in a common way and so leverage your knowledge, experience and the investment your company has made in automation. – There is a better way to manage samples! Mosaic software provides advanced functionality and impeccable support for sample management across global or multi-site inventories. Find out more here.